Maruti Suzuki Desert Storm is an endurance car rally initiated by Maruti Suzuki in 2003, about 14 years ago. Maruti Suzuki Desert Storm rally puts drivers and their machines to extreme test, similar to Dakar Rally in South America. At present, the 15th edition of #MSDesertStorm was in progress in the deserts of Rajasthan. It was flagged off at Noida on 29th of January. On its Leg 2, Maruti Suzuki Desert Storm was flagged off at Bikaner’s LaxmiNivas Palace (which I had visited in December- check the photos here). 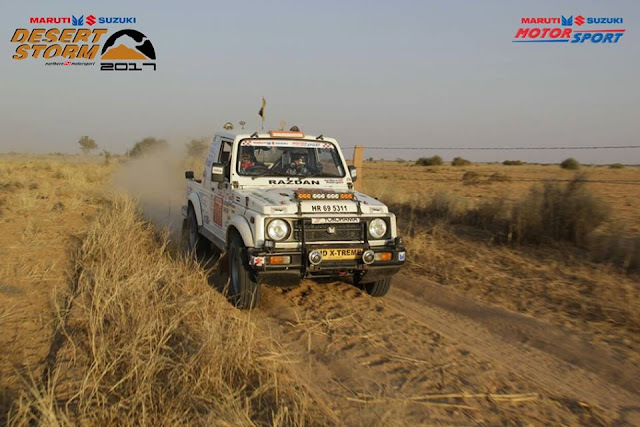 Participants covered 522 kms on their way to Golden city Jaisalmer, a journey that involved 3 different competitive stages. The Rally will end this weekend at Jodhpur. 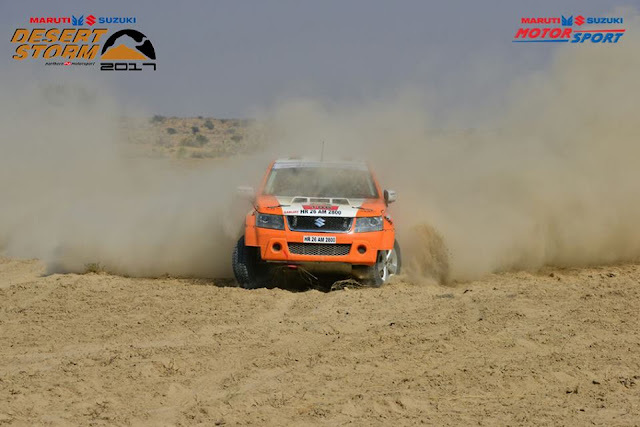 During the leg 2, Sanjay Agarwal was leading the four wheeler section (Xtreme Category) whereasthe 10 time Maruti Suzuki Raid De Himalaya winner, Suresh Rana, was on the third positon. Dakar Rally’s only Indian participant, C S Santosh, was seen leading the motor cycle track (Xtreme Moto category). I had the opportunity of meeting him few years ago at his Big Rock farm near Kolar where he helps enthusiasts’ master dirt biking skills. Santosh was closely followed by R Nataraj and Sanjay Kumar. Rallies like #MSDesertStorm are challenging because it is not always about speed. It is usually about endurance, knowing your vehicle very well to make the most of it, being able to navigate precisely despite dust and low visibility all around and maintaining top place in the leader board day after day. The track is certainly not the well paved highways, but the dirt tracks and off-road tracks, which command extreme driving skills to ensure that vehicles do not get stuck at wrong spot. Cars participating in #MSDesertStorm are under 3 categories- less than 1350 CC, 1350-1850 CC and 1850 cc and above. Two wheel drive cars are also participating, including 2017 ICOTY winner VitaraBrezza. Leg 4 Updates:In the Leg 4, CS Santosh maintained his lead, finishing about 10 minutes earlier than team TVS. On the Xtreme front, Suresh Rana and Ashwin Naik of team Maruti Suzuki were seen holding the lead whereas Suvrajit Dutta leaded the Ndure category.The participants completed a total distance of around 300 KM along the city’s golden Sam dunes crossing TurkonkiBasti, Siambar and Mangaliyawas. 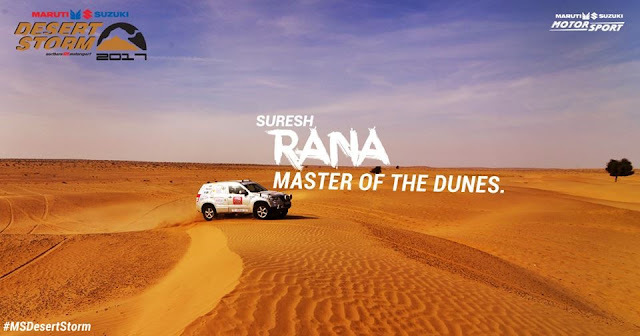 Final Leg or Leg 5 Updates:After six days of competition in the gruelling deserts of Rajasthan, Team Maruti Suzuki’s Suresh Rana and Ashwin Naik, TVS racing rider R Nataraj, Nikunj Toshniwal with co driver Survajit Dutta and KarthickMaruthiwon the rally in the Xtreme, Moto, Ndurance andXplore categories respectively. You can stay tuned to Maruti Suzuki’s Facebook page or twitter for latest updates on motorsports and contests in which you can win cool stuff.